Nice roundup! I’m a huge fan of the 100-proof bonded Apple Brandy (I find their regular Applejack somewhat underwhelmming compared to it), so I recently picked up a bottle of the 12-year-old rare Apple Brandy ($60 in CA) which is incredibly smooth, and rich in apple flavor. I also recently discovered a delicious Jack Rose variation by simply adding a small amount (~1/4 oz) of Cinnamon syrup (recipe easily found on several cocktail blogs). What a pleasure to read Adam’s tasting notes. It’s my understanding that both the bonded Applejack and the Old Apple Brandy products are not distributed in New York or Massachusetts. In fact, I once heard David Wondrich say that the only place to get the stuff was to make a trip to New Jersey. I’m sure I misheard Wondrich: Adam got it shipped to him. When I landed here in California I was surprised to see the bonded product on liquor store shelves; it’s the one applejack served at Alembic. I’ve also seen the blended stuff for sale, but have not seen Old Apple Brandy here on the West Coast. In my personal experience, I was quite happy to mix with and drink the blended product, but once I’d had a chance to sample the straight product I felt a bit sheepish having been so gung-ho about the blend. I agree with Adam completely that they’re wildly different from each other — on the “packed with flavor” scale, the bonded stuff is off the charts, and side-by-side with the blend one is faced with that too-smooth, watery quality provided by the presence of so much neutral grain. DougP: The cinnamon syrup sounds great! Another variation I’ve been doing — for both Marconi Wirelesses and Manhattans — is adding a very small amount of Yellow Chartreuse. I find that it makes the drink almost creamy tasting. Give it a try if you’re in the mood for something a little different. Cheers Lauren for posting Mr. Holliday’s recipe for the Boutonniere (I like the name fine). It’s outstanding! I am in Boston and want to try this bonded Applejack! Any ideas about finding it closer, like New Hampshire or Rhode Island?? 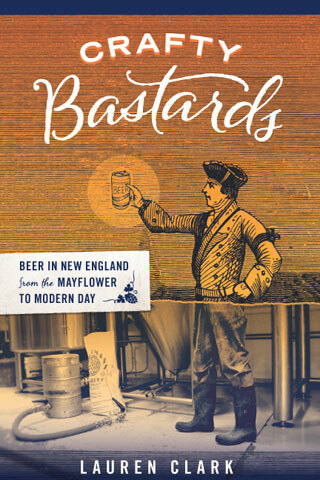 Penelope, one reader told me that the Laird’s Bonded was available recently at Blanchard’s in Allston. I have never seen it in a NH liquor store, although they do usually carry the standard Applejack. As for RI, I would ask Michael Dietsch of the blog A Dash of Bitters (http://www.adashofbitters.com/). He lives in RI. I’m sorry I’m only now seeing this. 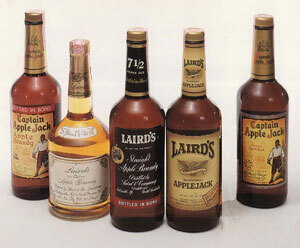 I haven’t found bonded Laird’s in RI yet, and I haven’t asked anyone whether they can special-order it. I should get on that, though, because I really miss the bonded Laird’s. I’m aware that this is a rather old post and it’s possible that Laird’s Bonded has since become more widely available, but until this evening I had never seen it in any liquor store in the Boston area (and I’ve been to many). Tonight I happened into Downtown Wine & Liquors in Davis Square, Somerville, and was shocked to find a number of bottles on the shelf. So of course I snapped one up, and stumbled here in search of recipes. I’m about to go make myself a Boutonniere (whether or not it’s called something else now). Cheers!